So, 06:45 Sunday Morning: His Podgeness rises from his pit to have an early breakfast before seeking out his trusty Colnago Geo Dream Bicycle ready to venture out for his first ride a for a long time now. At 09:00, His Podgeness makes his second cup of coffee (no milk, no sugar) and a cup of tea to take up to the slumbering Mrs Me. At 09:45, His Podgeness makes a second cup of tea for Mrs Me as she still hasn’t arisen, only to find that she stirred after all and threatening to come downstairs to shatter the peace and solitude. Hmmm, thinks Podge, maybe I should wait and give her company over breakfast. At 10:30, the decision is taken to go to Waitrose to get some BBQ provisions – the day is after all beautifully hot and sunny. So, His Podgeness puts his bike away and readies for shopping. 12:15, His Podgeness and Mrs Me return laden with food and wine, sits down and has a cup of tea. Podge gets his bike out again. 12:45, Master Matthew rises from his pit after a heavy night out on the tiles celebrating his birthday. No ride just yet, have to give Matt his pressies. 13:30, Master Nicholas arrives from his night out, no reason, just a night out. 14:00 discussions switch to grass cutting; His podgeness seeks out some appropriate attire for cycling while Mrs Me dress’s for mowing. 14:30, at the hint of grass cutting, Master Mathew and Mistress Alice (Matt’s superior half) slope off to the pub arranging to meet Master Nicholas at the local cinema. 14:50, His Podgeness finally, sets of on his bike: there really should be a fanfare here at the moment but such temptations are to be resisted. 15:15, Master Nicholas helps Mrs Me out with the grass cutting by taking the mower round to the font garden for her (she’s already cut the rear garden), then he also slopes off. That’s good said Mrs, I’ve cut the grass. Go and have a shower and then we can both sit down for a nice glass of wine. Perfick, just perfick. 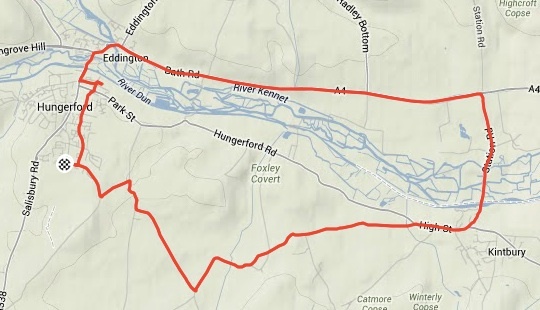 Distance: – 9.3 miles / Average Speed: – 10.6 mph / Average heart rate: – 156 bpm. And so, there we have it, 8 hours after getting up, His Podgeness eventually went for ride.